Officially Winter started yesterday 1st of June. I am in southern hemisphere. So our seasons are opposite to the northern hemisphere. Had a thunderstorm last night and woke up to a cold, windy and rainy day. Brrrr! Heater is turned on and writing this post with a hot cup of tea. I have a new Runway Inspired Challenge to share with you. This challenge is sponsored by Winnie and Walter. Here is challenge for you by J Crew. I love the sparkle on the grey dress and the black colour coat over it. 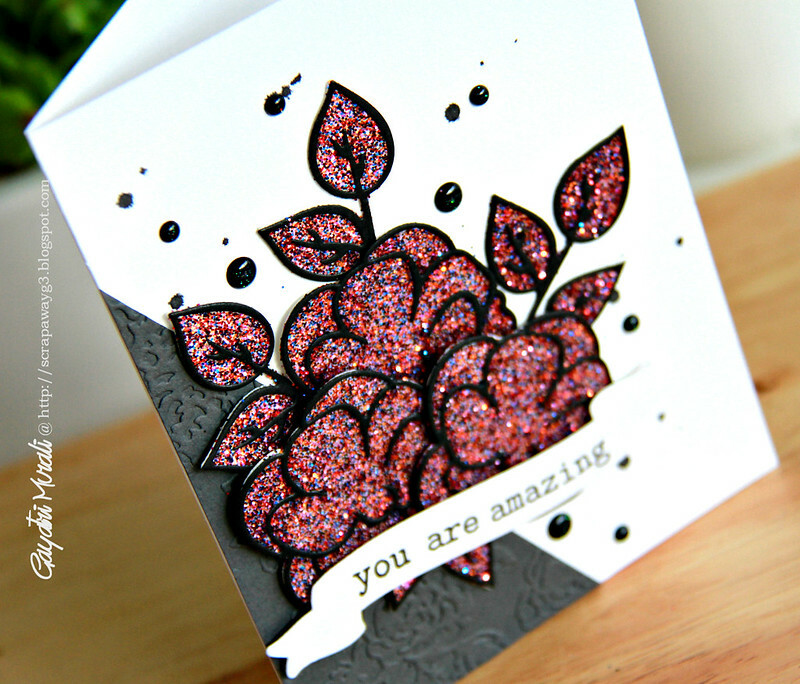 I tried to bring in the sparkle and colours into my card using Winnie & Walter products. Here is my card for the challenge. I have used Maggie’s Roses Cutaways from Winnie & Walter as my focal point. I adhered an adhesive sheet on white cardstock, die cut the solid flower cutaway. I then mixed some red, black, silver and blue glitter. 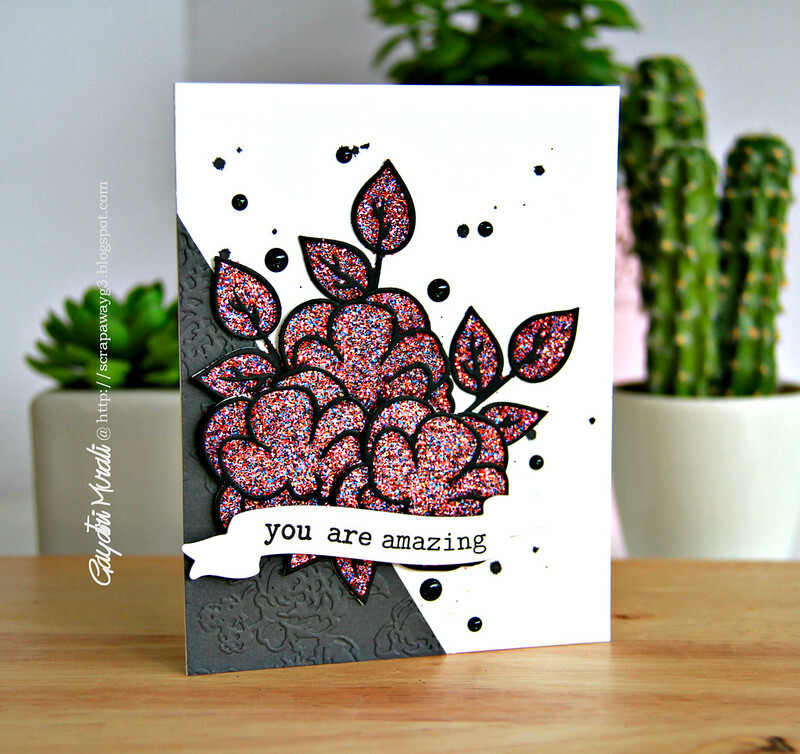 I die cut the outline cutaway using black cardstock and adhered on the solid cutaway before adding the glitter to the flowers. I did exactly the same with the leaves. On a white card base, I spattered some black Mr. Huey, then adhered a grey embossed cardstock at an angle. Then I adhered the glitter flowers and leaves at varied dimensions. I then added some sparkle black enamel dots. The sentiment is from The Big, the Bold and You stamp set stamped on the banner die cut using The Big, the Bold and Extras cutaway. Both are from Winnie & Walter. Check out Runway Inspired Challenge Blog for more design team inspiration. Play along the challenge to win awesome prize from Winnie & Walter. And your card is amazing! I love this design. Perfect that this outfit is seasonally appropriate for you! Wow! 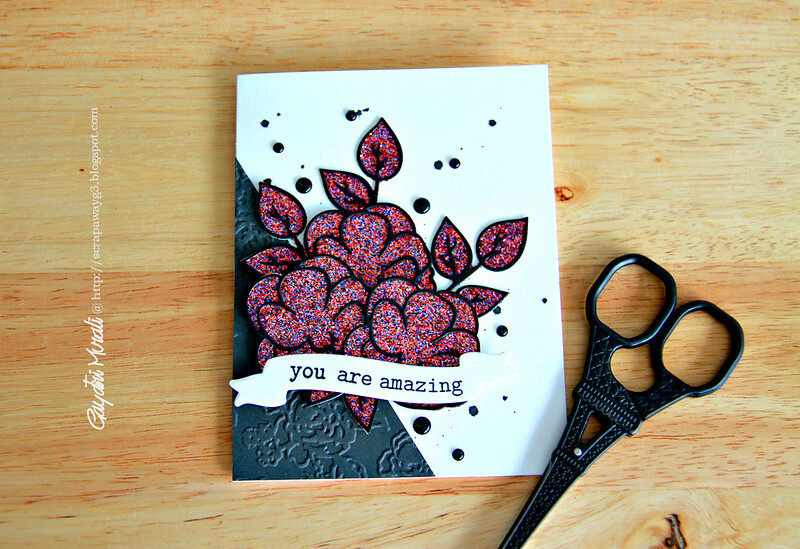 Superb card, I totally love the way you've used the glitter and the layout is awesome. LOVE! OH MY!!!!! You are insanely creative, Gayatri!!!! I love how you mixed some glitter to create your own color. Awesome effect!!!!!! Your card is so inspiring!